In a quiet corner of the Ziibiwing Center, between permanent exhibits on the environmental changes that resulted from the effects of colonization and the sacred language and strength of the Anishinabe (first man), is a half-moon bench under a sign that explains the phenomenon of blood memory - the ancestral bond every person has to the language, music, spirituality, and other cultural components of their people. 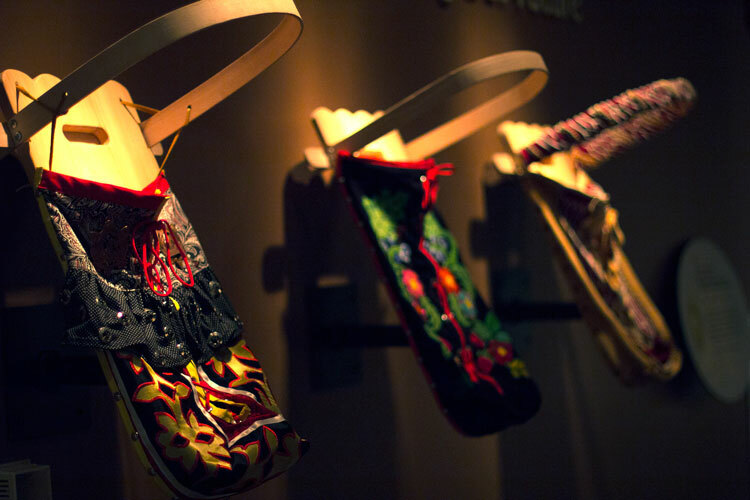 On the wall across from the bench are three strikingly decorated traditional wood and fabric baby carriers. This room represents the Anishinabe peoples’ seventh prophecy: the Anishinabek nation will be reborn and the newly born will rekindle the knowledge of their elders. 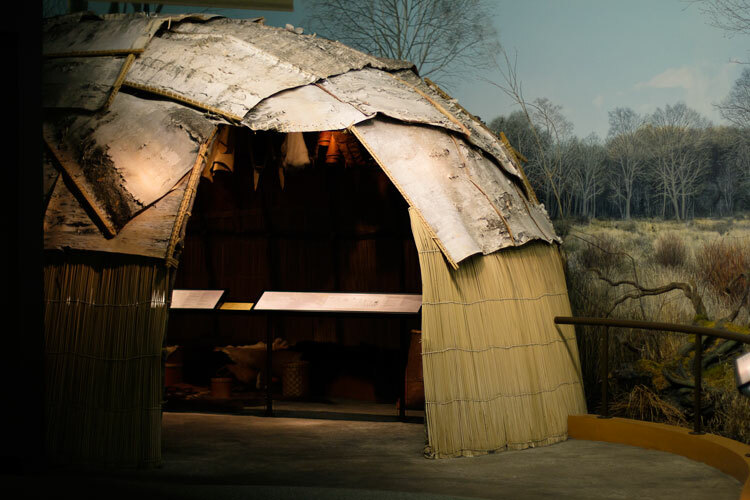 The exhibits that come next highlight the ways the native people of the great lakes region are doing that, and contributing to their communities at the same time. Though Ziibiwing Center didn’t open until 2004, it has long been a dream of the Saginaw Chippewa Indian Tribe elders. “There are tribal council minutes from the 1950’s where they talked about this,” says Johnson. And the vision of those elders is taken seriously. Unlike traditionally curated museums, the Ziibiwing Center is a community-led cultural center. This means that while Johnson’s official title is “curator” he does more community engagement than simple curation. Everything from signage to programming to the very form of the mannequins on exhibit throughout the center are crowd-sourced. 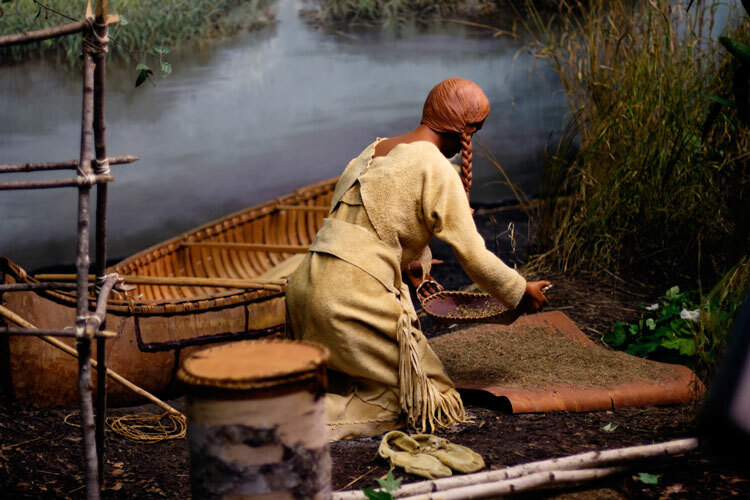 “If you knew these people, you’d recognize them,” Johnson explained, gesturing to a terra-cotta mannequin just outside the center’s teaching lodge. That’s because each mannequin in the center’s Diba Jimooyung — the permanent exhibits which are collectively titled “Telling Our Story” — was custom-made in the likeness of a community member turned model. Johnson says the decision to feature custom mannequins was out of necessity. When the center was being built mannequins that looked like Native Americans weren’t available. Instead, they turned to the community. “We invited anyone who wanted to model to come out and try,” says Johnson. From there they chose the models that best fit the exhibits they had planned, and a company out of the U.K. built the forms in the community members' likeness. The decision has since proven beneficial in ways never imagined at the outset. Mannequins of those who have since passed away are a life-size monument for their families, and by using real people from the community as models the diversity of tribal members’ features and builds can be appreciated throughout. Showcasing that diversity and dispelling the stereotypes and myths about American Indian people is part of the center’s main mission. Johnson says challenging notions that visitors have about Native Americans helps them think critically about historical depictions and recognize that tribal citizens are just like everyone else. It’s work that Johnson and the Ziibiwing Center team do in conjunction with the Michigan Anishinaabek Cultural Preservation and Repatriation Alliance (MACPRA), a group that represents all of the federally-recognized tribes in Michigan, plus two state-designated historic tribes. And it’s made possible by the Native American Graves Protection and Repatriation Act (NAGPRA) of 1990. NAGPRA addresses the ownership and possession of Native Indian and Native Hawaiian cultural items. 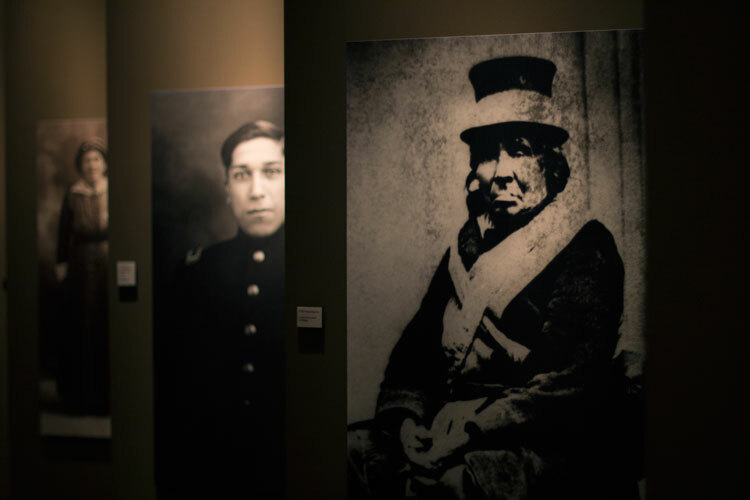 Executed by the U.S. Department of the Interior, NAGPRA requires federal agencies and institutions that receive federal funding to return important cultural items and remains to their rightful owners - American Indian tribes and Native Hawaiian organizations. This means everything from artifacts to human remains that have historically been held in places such as universities can be brought home. For human remains, it’s the chance to finally be laid respectfully to rest. To honor the ancestors Ziibiwing helps repatriate, a Recommitment to the Earth Ceremony is held each time remains are brought back for burial. The ceremony begins before the remains are ever moved, with careful preparation for the journey. It continues with a sacred re-burial ceremony at the Chippewa Township Nibokaan Cemetery, and concludes with a journey feast. The next Earth Ceremony will take place on May 10, 2019. Interested and respectful public are welcome to attend. The Ziibiwing Center is located at 6650 E. Broadway in Mt. Pleasant, Michigan and is open Monday through Saturday for groups and individuals. 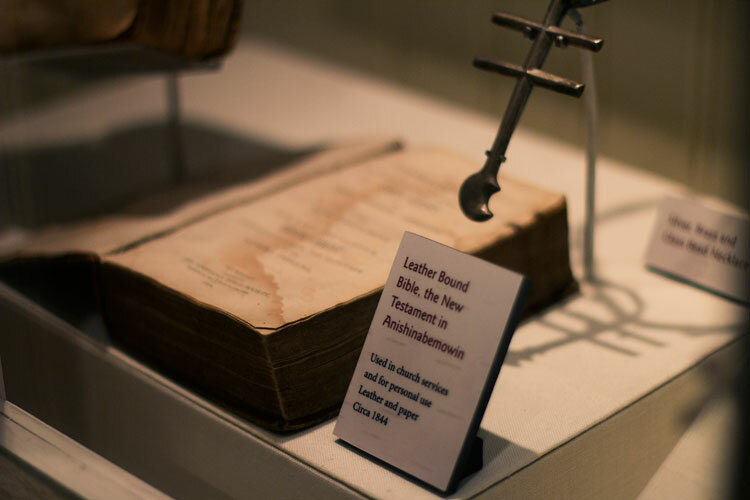 The center’s award-winning permanent exhibit is on display year round, with an additional temporary exhibit that changes periodically. The center features over 500 artifacts, two theaters displaying educational programming, and a gift shop. For additional information visit the Ziibiwing Center website.